In this study we use a new spectral relaxation method to investigate heat transfer in a nanofluid flow over an unsteady stretching sheet with thermal dispersion and radiation. Three water-based nanofluids containing copper oxide CuO, aluminium oxide Al2O3 and titanium dioxide TiO2 nanoparticles are considered in this study. The transformed governing system of nonlinear differential equations was solved numerically using the spectral relaxation method that has been proposed for the solution of nonlinear boundary layer equations. Results were obtained for the skin friction coefficient, the local Nusselt number as well as the velocity, temperature and nanoparticle fraction profiles for some values of the governing physical and fluid parameters. Validation of the results was achieved by comparison with limiting cases from previous studies in the literature. We show that the proposed technique is an efficient numerical algorithm with assured convergence that serves as an alternative to common numerical methods for solving nonlinear boundary value problems. We show that the convergence rate of the spectral relaxation method is significantly improved by using the method in conjunction with the successive over-relaxation method. In recent years flow and heat transfer over a stretching surface has been extensively investigated due to its importance in industrial and engineering applications such as in the heat treatment of materials manufactured in extrusion processes and the casting of materials. Controlled cooling of stretching sheets is needed to assure quality products. Fiber technology, wire drawing, the manufacture of plastic and rubber sheets and polymer extrusion are some of the important processes that take place subject to stretching and heat transfer. The quality of the final product depends to a great extent on the heat controlling factors, and the knowledge of radiative heat transfer in the system can perhaps lead to a desired product with a sought characteristic. The development of a boundary layer over a stretching sheet was first studied by Crane , who found an exact solution for the flow field. This problem was then extended by Gupta and Gupta  to a permeable surface. The flow problem due to a linearly stretching sheet belongs to a class of exact solutions of the Navier-Stokes equations. Since the pioneering work of Sakiadis , various aspects of the stretching problem involving Newtonian and non-Newtonian fluids have been extensively studied by several authors (see Cortell , Hayat and Sajid , Liao , Xu ). The study of radiation effects has important applications in engineering. Thermal radiation effect plays a significant role in controlling heat transfer process in polymer processing industry. Many studies have been reported on flow and heat transfer over a stretched surface in the presence of radiation (see El-Aziz [8, 9], Raptis , Mahmoud ). El-Aziz  studied the radiation effect on the flow and heat transfer over an unsteady stretching sheet. He found that the heat transfer rate increases with increasing radiation and unsteadiness parameters and the Prandtl number. The effect of the radiation parameter on the heat transfer rate was found to be more noticeable at larger values of the unsteadiness parameter and the Prandtl number. In addition to radiation, it is important to consider the thermal dispersion effect on boundary layer flow since this has a direct impact on the heat transfer rate. Several studies on hydrodynamic dispersion have been reported in the literature. The double-dispersion phenomenon in a Darcian, free convection boundary layer adjacent to a vertical wall, using multi-scale analysis arguments, was investigated by Telles and Trevisan . In recent years tremendous effort has been given to the study of nanofluids. The word nanofluid coined by Choi  describes a liquid suspension containing ultra fine particles (diameter less than 50 nm). Experimental studies (e.g., Masuda et al. , Das et al. , Xuan and Li ) showed that even with a small volumetric fraction of nanoparticles (usually less than 5%), the thermal conductivity of the base liquid is enhanced by 10-50% with a remarkable improvement in the convective heat transfer coefficient. The literature on nanofluids was reviewed by Trisaksri and Wongwises , Wang and Mujumdar  among several others. Nanofluids thus provide an alternative to many common fluids for advanced thermal applications in micro and nano-heat transfer applications. Thermophysical properties of nanofluids such as thermal conductivity, diffusivity and viscosity were studied by Kang et al. , Velagapudi et al. , Rudyak et al. . Hady et al. studied the radiation effect on the viscous flow of a nanofluid and heat transfer over a nonlinearly stretching sheet. They observed that the increase in the thermal radiation parameter and the nonlinear stretching sheet parameter yields a decrease in the nanofluid temperature leading to an increase in the heat transfer rate. The boundary layer flow of a nanofluid with radiation was studied by Olanrewaju et al. . They observed that radiation has a significant influence on both the thermal boundary layer thickness and the nanoparticle volume fraction profiles. Recently, Mahdy  studied the effects of unsteady mixed convection boundary layer flow and heat transfer of nanofluids due to a stretching sheet. He found that the heat transfer rate at the surface increased with the mixed convection parameter and the solid volume fraction of nanoparticles. Moreover, the skin friction increased with the mixed convection parameter and decreased with the unsteadiness parameter and the nanoparticle volume fraction. Narayana and Sibanda  studied the effects of laminar flow of a nanoliquid film over an unsteady stretching sheet. They found that the unsteadiness parameter has the effect of thickening the momentum boundary layer while thinning the thermal boundary layer for Cu-water and Al2O3-water nanoliquids. Kameswaran et al. studied the effects of hydromagnetic nanofluid flow due to a stretching or shrinking sheet with viscous dissipation and chemical reaction effects. They observed that the velocity profile decreased with an increase in the nanoparticle volume fraction, while the opposite was true in the case of temperature and concentration profiles. The objective of this study is to analyze the effects of fluid and physical parameters such as thermal dispersion, nanoparticle volume fraction and radiation parameters on the flow and heat transfer characteristics of three different water based nanofluids containing copper oxide CuO, aluminium oxide Al2O3 and titanium dioxide TiO2 nanoparticles. The momentum and energy equations are coupled and nonlinear. By using suitable similarity variables, we convert these equations into coupled ordinary differential equations and solve them numerically via a novel iteration scheme called the spectral relaxation method (SRM) (see Motsa and Makukula , Mosta ). The SRM is an iterative algorithm for the solution of nonlinear boundary layer problems which are characterized by flow properties that decay exponentially to constant levels far from the boundary surface. The key features of the method are the decoupling of the governing nonlinear systems into a sequence of smaller sub-systems which are then discretized using spectral collocation methods. The method is very efficient in solving boundary layer equations of the type under investigation in this study. In cases where the SRM convergence is slow, it is demonstrated that successive over-relaxation can be used to accelerate convergence and improve the accuracy of the method. The current results were validated by comparison with published results in the literature and results obtained using the Matlab bvp4c routine. We further show that substantial improvement in the convergence rate of the SRM may be realized by using this method in conjunction with the successive over relaxation method. ∂ T ∂ t + u ∂ T ∂ x + v ∂ T ∂ y = α n f ∂ 2 T ∂ y 2 − 1 ( ρ C p ) n f ∂ q r ∂ y + ∂ ∂ y ( α y ∂ T ∂ y ) . u ( x , 0 ) = u ( x ) , v ( x , 0 ) = 0 , T ( x , 0 ) = T w ( x ) . where u, v are the velocity components in the x and y directions, respectively, T is the fluid temperature, C p is the specific heat at constant pressure, r 1 and m are constants, the expression for the effective thermal diffusivity taken as α y = α m + γ d u , α m is the molecular thermal diffusivity, γ d u represent thermal diffusivity, γ is the mechanical thermal dispersion coefficient and d is the pore diameter. ( ρ C p ) n f = ( 1 − ϕ ) ( ρ C p ) f + ϕ ( ρ C p ) s .
k n f = k f [ k s + 2 k f − 2 ϕ ( k f − k s ) k s + 2 k f + ϕ ( k f − k s ) ] . u = ( b x 1 − α t ) f ′ ( η ) and v = − ( ν f b 1 − α t ) 1 2 f ( η ) . k R = 1 + 4 3 N R .
ϕ 1 = ( 1 − ϕ ) 2.5 [ 1 − ϕ + ϕ ( ρ s ρ f ) ] and ϕ 2 = 1 − ϕ + ϕ ( ρ C p ) s ( ρ C p ) f .
The thermophysical properties of water and nanofluids used in this paper are given in Table 1.
τ w = − μ n f [ ∂ u ∂ y ] y = 0 = − 1 ( 1 − ϕ ) 2.5 ρ f ν f 1 2 ( b 1 − α t ) 3 2 x f ″ ( 0 ) . C f ( 1 − ϕ ) 2.5 R e x 1 2 = − 2 f ″ ( 0 ) . q w = − k n f [ ∂ T ∂ y ] y = 0 = − k n f ( T w − T ∞ ) ( b ν f ( 1 − α t ) ) 1 2 g ′ ( 0 ) . N u x = x k f q w T w − T ∞ . where R e x is the local Reynolds number defined by R e x = x U w / ν f .
g ( 0 ) = 1 , g ( ∞ ) → 0 .
s = ϕ 1 .
f ( η ) = 1 − e − η with f ″ ( 0 ) = − 1 .
g ″ − P r ( k f k n f ) ϕ 2 k R [ r 1 f ′ g − f g ′ ] = 0 .
where λ 1 = ( k f k n f ) ϕ 2 k R and P r ∗ = P r / s 2 is the modified Prandtl number. M [ a , b , z ] = ∑ r = 0 ∞ a ( a + 1 ) ⋯ ( a + r − 1 ) b ( b + 1 ) ⋯ ( b + r − 1 ) z r ! g ( η ) = e − s η α M [ α − r 1 , α + 1 , − α e − s η ] M [ α − r 1 , α + 1 , − α ] . α = λ 1 P r ∗ . Reduce the order of the momentum equation for f ( η ) by introducing the transformation f ′ ( η ) = p ( η ) and express the original equation in terms of p ( η ) . Assuming that f ( η ) is known from a previous iteration (denoted by f r ), construct an iteration scheme for p ( η ) by assuming that only linear terms in p ( η ) are to be evaluated at the current iteration level (denoted by p r + 1 ) and all other terms (linear and nonlinear) are assumed to be known from the previous iteration. In addition, nonlinear terms in p are evaluated at the previous iteration. The iteration schemes for the other governing dependent variables are developed in a similar manner but now using the updated solutions of the variables determined in the previous equation. g r + 1 ( 0 ) = 1 , g r + 1 ( ∞ ) → 0 .
where p is the order of the derivative. A 3 = diag [ 1 + D p r + 1 + 1 ϕ 2 ( k n f k f ) ( 1 + 4 3 N R ) ] D 2 + diag [ D p r + 1 ′ + P r ( f r + 1 − S η 2 ) ] D − r 1 P r diag [ p r + 1 ] − P r S m I , B 3 = O . In equations (52)-(54), I is an identity matrix. The size of the matrix O is ( N + 1 ) × 1 and diag [ ] is a diagonal matrix, all of size ( N ¯ + 1 ) × ( N ¯ + 1 ) where N ¯ is the number of grid points, f, g and p are the values of the functions f, g and p, respectively, when evaluated at the grid points and the subscript r denotes the iteration number. f 0 ( η ) = 1 − e − η , p 0 ( η ) = e − η , g 0 ( η ) = e − η . A X r + 1 = ( 1 − ω ) A X r + ω B . The results in the next section show that for ω < 1 , applying the SOR method improves the efficiency and accuracy of the SRM. We have studied heat transfer in a nanofluid flow due to an unsteady stretching sheet. We considered three different nanoparticles, copper oxide (CuO), aluminium oxide (Al2O3) and titanium oxide (TiO2), with water as the base fluid. The spectral relaxation method algorithm (49)-(51) has been used to solve the nonlinear coupled boundary value problem due to flow over a steady stretching sheet in a nanofluid. We established the accuracy of the spectral relaxation method by comparing the SRM results with those obtained using the Matlab bvp4c solver. The comparison in Tables 3-8 shows a good agrement between the two methods. This comparison provides a benchmark to measure the accuracy and efficiency of the method. The heat transfer coefficients are shown in Table 2 for different values of the unsteadiness parameter and the Prandtl number. The smaller Prandtl numbers in Table 2 suggest a greater rate of thermal diffusion compared to momentum diffusion so that heat conduction is more significant than convection, while P r = 10 (for example, water at 1 bar and 280 K) is indicative of processes where convection is more effective than conduction. It is clear that the heat transfer coefficient increases with an increase in the Prandtl numbers. Table 2 also gives a comparison between the spectral relaxation method and the established Matlab bvp4c solver. The present results are in good agreement with the earlier findings by El-Aziz . The numerical methods give results that are consistent to nine significant digits after 38 iterations of the spectral relaxation method. Tables 3-4 show the skin friction and the heat transfer coefficients (which are respectively proportional to − f ″ ( 0 ) and − g ′ ( 0 ) ) for different levels of unsteadiness within the problem. Table 3 gives a comparison of the SRM results in the absence of the nanoparticle volume fraction (i.e., ϕ = 0 ). Firstly, we observe that both the skin friction and the heat transfer coefficients increase with unsteadiness. The skin friction increases as the unsteadiness parameter increases. This is a consequence of the inverted boundary layer that is formed. The negative values of f ″ ( 0 ) are an indication that the solid surface exerts a drag force on the fluid. This is due to the fact that the development of the boundary layer is caused solely by the stretching sheet. Secondly, we note that the number of iterations required for the two methods to give a consistent solution decreases as the unsteadiness parameter increases. We further note that the number of iterations to convergence of the SRM decreases by more than a factor of 2 if the SRM is used in conjunction with the SOR method. The fact that the SRM solutions are in good agreement with the bvp4c results is indicative of the accuracy and robustness of the spectral relaxation method. Table 4 shows the effect of flow unsteadiness, the Prandtl number, thermal dispersion and the radiation parameter on the heat transfer coefficient in the absence of nanoparticles. The heat transfer coefficient decreases with an increase in thermal dispersion and increases with thermal radiation. The results show that the rate of unsteady heat transfer can be accelerated by the thermal dispersion. The thermal dispersion may be regarded as the effect of mixing to enhance heat transfer in the medium. Table 4 further gives a comparison of the SRM and the bvp4c results in the case ϕ = 0 . The spectral relaxation method converges to the numerical solutions for all parameter values matching the bvp4c results up to nine significant digits. Tables 5 and 6 show the skin friction coefficient and heat transfer rate for various physical parameters in the case of a CuO-water nanofluid. The skin friction coefficient and the local Nusselt number are more influenced by the nanoparticle volume fraction than the type of nanoparticles. This observation is in agreement with Oztop and Abu-Nada . In addition, water has the lowest skin friction coefficient and the local Nusselt number compared with CuO, Al2O3, TiO2 nanofluids. We observe that the skin friction coefficient decreases with increasing nanoparticle volume fraction, and the same trend is observed in the case of the heat transfer coefficient. Table 5 further shows that for a particular nanoparticle volume fraction, the skin friction coefficient increases with an increase in the unsteadiness parameter. A similar trend is observed in the case of the heat transfer coefficient. Tables 7 and 8 show the skin friction and heat transfer coefficients for various values of nanoparticle volume fraction and physical parameters. We note that the physical parameters N R and D have no direct effect on the skin friction coefficient, but that the skin friction decreases with an increase in the unsteadiness parameter. From Table 8 we observe that an increase in the thermal radiation parameter produces significant increases in the heat transfer coefficient. The skin friction and heat transfer rates decrease with an increase in the nanoparticle volume fraction. The effects of the unsteadiness parameter, various nanoparticles, thermal dispersion and radiation parameters on various fluid dynamic quantities are shown in Figures 1-6. (a) Velocity and (b) temperature profiles for P r = 6.7850 , N R = 1 , D = 1 , r 1 = 2 , m = 1.5 . Figure 1 shows the effect of the unsteadiness parameter on the velocity and temperature profiles, respectively, in the case of a CuO-water nanofluid. It is observed that velocity and temperature in the case of a clear fluid are less than those of a CuO-water nanofluid. Increasing the unsteadiness parameter results in a decrease in the thermal boundary layer thickness. We also observe that the temperature distribution decreases with an increase in the unsteadiness parameter in the case of both a clear fluid and the CuO-water nanofluid. These results are consistent with the findings of, among others, Singh et al. . Figure 2 shows the velocity and temperature distributions for different nanofluids. It can be observed that the velocity and temperature distributions for different nanoparticles increase gradually far from the surface of the stretching sheet. The fluid velocity and temperatures in the case of a CuO-water nanofluid are less than those in TiO2-water and Al2O3-water nanofluids. (a) Velocity and (b) temperature profiles for P r = 6.7850 , N R = 1 , D = 1 , r 1 = 2 , m = 1.5 , S = 0.5 , ϕ = 0.2 . The effect of thermal dispersion and radiation on the temperature profiles is shown in Figure 3(a). The temperature distribution along the boundary layer increases with increasing thermal dispersion parameter. In Figure 3(b) we observe that the temperature decreases throughout the boundary layer with increasing values of the radiation parameter. At a particular value of N R , the temperature increases with the nanoparticle volume fraction. These result can be explained by the fact that a decrease in N R leads to a decrease in the Rosseland radiation absorptivity which in turn increases the rate of radiative heat transferred to the fluid and hence the fluid temperature increases. These results are similar to those reported by El-Aziz  in the case of clear fluids. Temperature profiles for (a) P r = 6.7850 , S = 0.5 , N R = 1 , r 1 = 2 , m = 1.5 and (b) P r = 6.7850 , S = 0.5 , D = 1 , r 1 = 2 , m = 1.5 . Figure 4 shows the skin friction coefficient as a function of the nanoparticle volume fraction. The skin friction coefficient increases with increasing nanoparticle volume fraction. 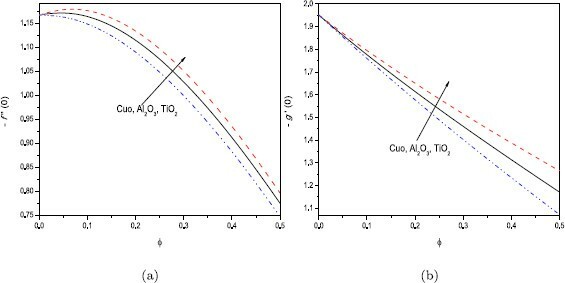 The maximum value of the skin friction in the case of a TiO2-water nanofluid is attained at higher values of ϕ in comparison with CuO-water and Al2O3 nanofluids. Further, we observe that a CuO-water nanofluid gives a higher drag force in opposition to the flow as compared to the other nanofluids. From Figure 4(b) we observe that the wall heat transfer rates for the nanofluids are increasing functions of ϕ. A TiO2-water nanofluid has higher wall heat transfer rate as compared to the other nanofluids. (a) Skin friction and (b) heat transfer coefficients as a function of nanoparticle volume fraction, when P r = 6.7850 , S = 0.5 , D = 1 , N R = 1 , r 1 = 2 , m = 1.5 . The variation of the skin friction and heat transfer rates with the fluid unsteadiness is shown in Figures 5-6 respectively. It is seen that increasing the solid volume fraction leads to decreases of skin friction and to an increase in the rate of heat transfer. An increase in the unsteadiness parameter tends to increase the local Nusselt number. (a) Skin friction and (b) heat transfer coefficients as a function of N R , when P r = 6.7850 , D = 1 , r 1 = 2 , m = 1.5 . (a) Skin friction and (b) heat transfer coefficients as a function of D , when P r = 6.7850 , N R = 1 , r 1 = 2 , m = 1.5 . The unsteady boundary layer flow in a nanofluid due to a stretching sheet with thermal dispersion and radiation was studied. The governing equations were transformed into a set of coupled nonlinear differential equations and solved by bvp4c and a novel spectral relaxation method. To determine the convergence, accuracy and general validity of the SRM, the results were compared with the Matlab bvp4c results for selected values of the governing physical parameters. We found that velocity and temperature in the case of a clear fluid are less than those of CuO-water nanofluid. We observe that the temperature decreases throughout the boundary layer with increasing values of the radiation parameter. The convergence rate of the SRM is significantly improved by using the method in conjunction with the SOR method with ω < 1 . Our findings show that the SRM is accurate and sufficiently robust for use in solving fluid flow problems and as an alternative to the Runge-Kutta and Keller-box schemes in finding solutions of boundary layer equations. The authors are grateful to the reviewers for their comments and constructive suggestions. We acknowledge financial support from the University of KwaZulu-Natal.